I’ve now used the RC-30 out on the road a couple of times, and it’s already improved my live performances massively! A huge thumbs up for this piece of kit – even after just two shows I feel like I couldn’t do without it. It’s very easy to use – you can use it as a simple one track looper, or get a bit more in depth with the dual tracks for some more advanced looping. Here’s a few thoughts on the pedal from my personal perspective as a performing solo guitarist/singer. Which loop pedal to choose? Loop stations are massively popular these days, and pretty much everyone knows about looping now, largely thanks to Ed Sheeran! I started using a looper about 8 years ago after watching this performance and went through a couple of pedals before sticking with the Boss RC-20XL. At the time, the Boss unit was the most solid and reliable unit I tried, and it had the bonus of a microphone input. 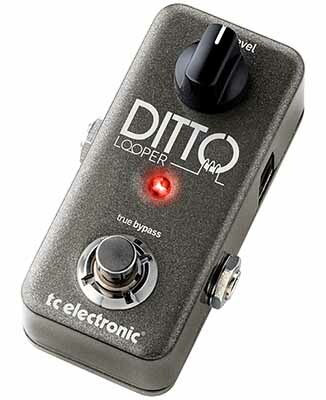 Loopers come in all shapes and sizes now, from the super simple one-pedal variety like the TC Electronic Ditto, through to multi-functional units like the Boss RC-300. There’s software loopers too, which connect to your laptop or iPad. 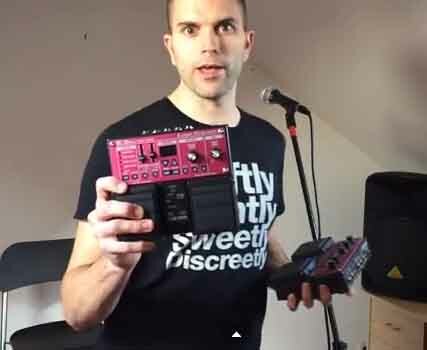 For me, a software looper is a no-no because a/ I need my setup to be fairly portable and quick to set up and b/ some of the venues I play get pretty rowdy, so I don’t really want to bring expensive equipment along to these types of places! Plus, introducing a laptop/tablet introduces more potential reliability problems – best to stick with one pedal which does the job, in my opinion. The first point in particular was my main reason for getting the RC-30. I’ve spoken to some fellow guitarists and read a few reviews, and the reliability of some other loopers seemed to be an issue. The one thing that everyone seemed to agree on was that the Boss gear is built to last – and if my old RC-20XL was anything to go by, that’s definitely true. I gigged that thing into the ground, and it never failed on me – I really need to be able to rely on my loop pedal, so I went ahead and ordered the RC-30. Before I get to the unboxing, a quick shout out for woodbrass.com. Since I’m in the UK, the pound is very strong against the Euro at the moment so it’s much cheaper to order gear from Europe. I’d never tried Woodbrass before, but their prices seemed good – and they included a free Boss PSU for the pedal. I’ve ordered gear from thomann.de before which has arrived with a European plug, so I checked with Woodbrass, and they send out a UK adapter with their orders. My order was delivered within a week of ordering – well packaged, with free delivery – and yes there was a UK adapter for the PSU. Brilliant service! So – out of the box I’m instantly reassured by the same solid build quality as the older pedal. I find the pedals on these units really easy to use and accurate for looping. I’ve never been convinced by the small button-style stompboxes – I’m sure some of them are great, but the ones I’ve tried haven’t always been easy to time loops accurately. No one bothers reading instructions, so let’s plug it in and see what happens. My first thought was “damn, they’ve sent me a faulty unit” because I couldn’t get any life out of it. It turns out that you have to insert a jack into the output on the back of the pedal before it will fire up. I guess they’ve done this to preserve battery life if using batteries. The first thing I notice is the improvement in sound quality over the RC-20. The instrument input is clear and crisp and on recording my first loop, the playback sounds identical to the signal. 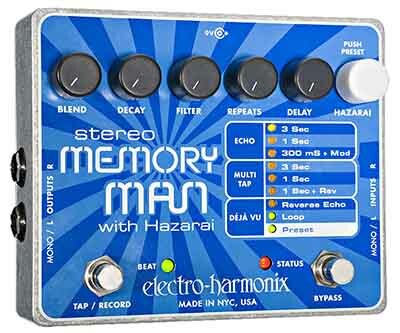 There was always a slight degradation with the old pedal, so I’m really pleased they’ve improved the preamps. Plugging a microphone into the RC-30 doesn’t fill you with dread in the way that the RC-20 did. An XLR input is now added, rather than a jack. 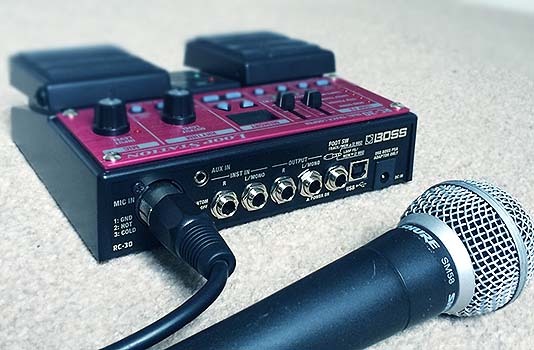 Recording a vocal loop is much better than the old pedal – but let’s qualify that by saying that that the RC-20’s mic preamp was barely useable. I did used to use it, but it was always muffled and pretty awful. The sound quality of a dynamic mic direct into the XLR input is decent (I’m using an SM58). However, I really wish they’d added some kind of on-board EQ for the mic input, even if it was just a high-pass filter. When you build up multiple vocal loops, it’s easy to get a build up of unwanted low frequencies – and anyone who’s worked with audio knows that low frequencies can quickly dominate everything. I’ve not tried a condenser mic into the pedal, as I will only be using a dynamic mic in live situations. However, the RC-30 includes phantom power should you require it, which is a nice touch. Overall – sound quality is vastly improved over the RC-20. I’ve been using it live to build guitar and vocal loops and it’s good – gives me much more confidence than the older pedal. Like I say though, I really wish they’d included a simple 3-band EQ on that mic input, or just a low cut button would’ve been better than nothing. It’s easy to get up and running quickly with the RC-30. Plug in, hit the left pedal to record a loop and hit it again to playback. The first thing you’ll notice if you’re used to the RC-20 like me is that the loop instantly starts overdubbing when you start playback. It took me a few goes to get used to this, but it will be second nature before long. It’s a better way of looping because you can instantly start building your loop up – great in live situations. So, yep, nice and easy to use straight out of the box, and the second thing I notice is that the pedal is lovely and responsive. The old RC-20XL had a really annoying trait whereby there was a tiny delay after hitting the playback button when you record your first loop. I’m very pleased to report that the RC-30 eliminates this problem, and the loop starts exactly when you expect it to. It’s amazing how off-putting that little delay was, it’s probably a matter of milliseconds but can throw your entire timing out. 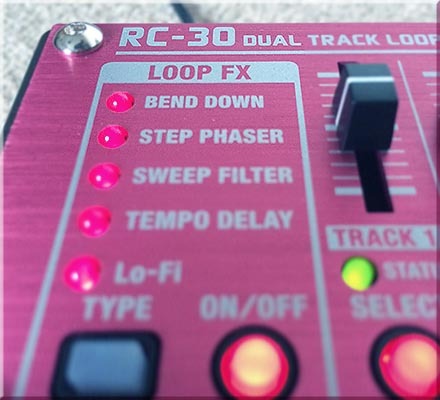 The RC-30 is spot on, and it’s instantly improved my looping – now I have 100% confidence in my loops and I know that if there’s any timing issues then that’s my fault not the pedal’s. – the pedal functions remain exactly the same: record/overdub with the left pedal and stop playback with the right pedal. However now you are recording/overdubbing/stopping playback on track 2 – while track 1 continues playing the loop you’ve already recorded. Simple? Yeah, pretty much – once you get the hang of it it’s a doddle. However I do stand by what I said in my video review – this pedal will be much easier to use with the optional footswitch – either the Boss FS-5U single pedal or better, the FS-6 dual switch. 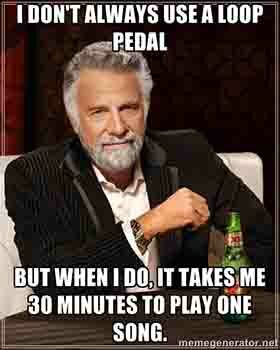 This will eliminate that annoying 2 second delay when holding down the right hand pedal to switch tracks. 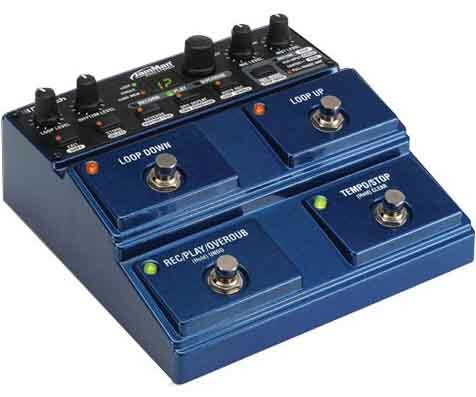 If you’re singing while looping, which I do, I think the footswitch is pretty much essential. The other thing to mention quickly with dual tracks on the RC-30 is that double-tapping the right hand pedal stops playback of both tracks. Then, when you want to kick playback in again, it will start playing whichever track(s) you have selected at the time. Holding the right hand pedal down will toggle between track 1, track 2, or both tracks together. Now this is where it gets fiddly if playing live. For example, I sometimes want to drop everything out momentarily, then bring the whole loop back in. This is nigh-on impossible without the extra footswitch because you have to double tap the right pedal, then toggle tracks by holding down the right pedal until both tracks are active – then hit left to playback. If you only have a second or two to do this, it’s not possible! I have a couple of songs where this is what I want to do, so I’ll need to get the footswitch to do this in live situations. I was kind of hoping the footswitch functions would be customisable – but from what I’ve read it seems that their functions are fixed. This is a little annoying – if anyone knows any different, please comment below and let me know. So that’s the main guts of it covered. It’s worth quickly mentioning some of the other stuff this pedal can do. There’s a selection of onboard FX which I’ve had a quick play around with, and they’re pretty useable. I like the sweep filter, and the downward pitch bend would be a pretty cool and unexpected way of ending a song in a live situation. The lo-fi effect sounds pretty cool too. Saying that, I’ve not actually figured out how I’m going to get any of these FX into my live show yet – but I may start sneaking the odd effect in soon! It has a complement of rhythm tracks, similar to the RC-20 pedal. I occasionally used the simple bassdrum track on the old pedal, but in all honesty I can’t see myself using any of these pre-recorded rhythm tracks. Does anyone actually ever use these? Boss say it can be used for “jamming at home” or whatever – I just can’t really imagine anyone actually doing this – but maybe it’s handy for a hobby guitarist or something. Personally, I build all my loops live so I probably won’t ever use the memory function. You can import loops from your computer too – I might explore this soon for some of my more complex loops. Could be pretty useful. Overall then, I’m really pleased that I chose the RC-30. If I was to give it a score, based on my main criteria of value-for-money, build quality, usability, features and sound quality, I’d give it 9 out of 10. 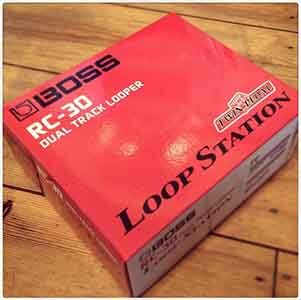 I’ve not tried any of the other loopers on the market at the moment so can’t do a comparison. All I can say is that it’s a dramatic improvement on the old RC-20XL pedal – much more useable and flexible, with much better sonic quality. There’s just a couple of little niggles that I’ve explained above, but I think you have to compromise a little, unless you go all-out and get one of the giant loop stations which make you a cup of tea and shine your shoes as you loop. I’ll look forward to a number of years of happy looping with this pedal! If you have any comments or suggestions, please post them in the comments below.